Excavated 1912, 1933, bombed in 1943, fully excavated 1951-2. Pompeii II.4.7a. May 2010. Looking east to II.4.7a along the north side of II.4 from II.4.7, showing remains of stucco. 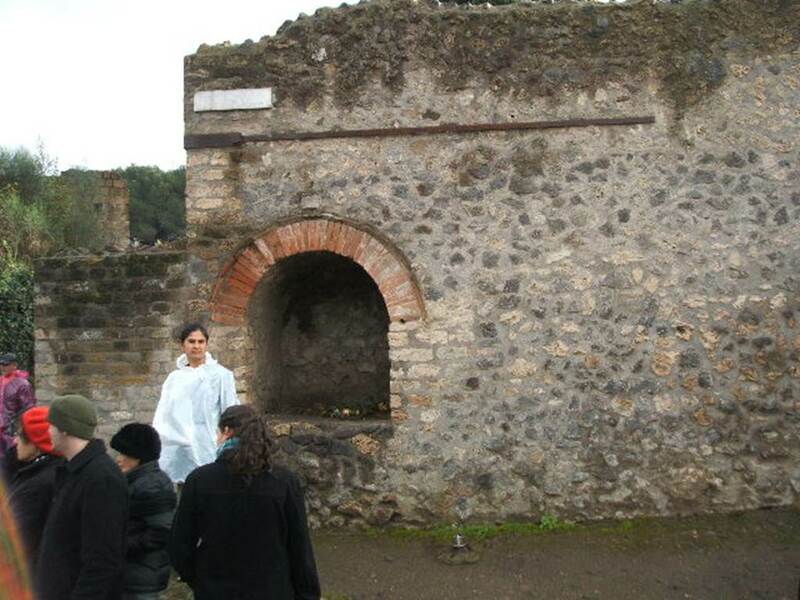 According to Parslow, in the previously unexcavated area between the baths and the compital shrine, Maiuri made a discovery c.1933-34. Painted on the rough white stucco, beginning 12ft (3.70m) west of the shrine, were electoral recommendations. These were CIL IV 7575 – 7583 and 7990. They were found in an excellent state but have since faded. 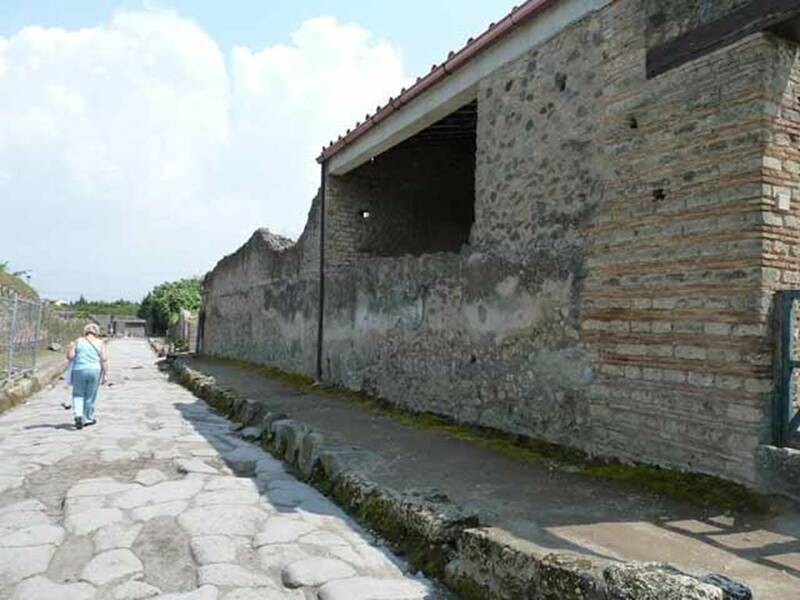 Pompeii II.4.7a. September 2005. Street shrine at east end of II.4. Pompeii II.4.7a. May 2010. Street shrine on north-east corner of II.4. Looking east along Via dell’Abbondanza towards the junction with Vicolo dell’Anfiteatro. According to Garcia y Garcia, two bombs fell on the north-east corner of this insula on 19th September 1943. 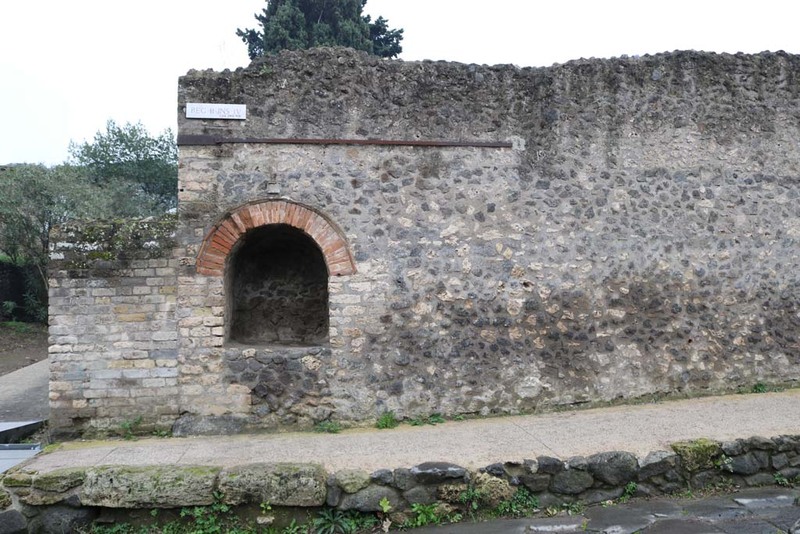 This damaged the perimeter wall on the Via dell’Abbondanza and the niche, which was then restored. Pompeii II.4.7a. December 2005. Street shrine on north-east corner of II.4. Looking west along Via dell’Abbondanza from Vicolo dell’ Anfiteatro. 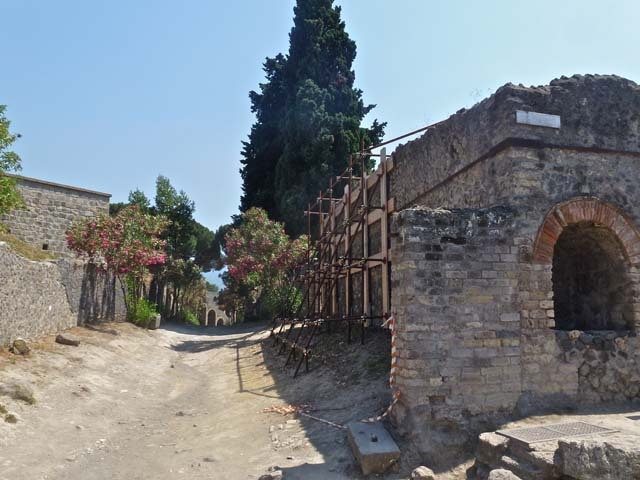 According to Garcia y Garcia, the same two bombs that fell on 19th September 1943, also destroyed the remains of a roofed portal that could close Vicolo dell’ Anfiteatro at its north end. 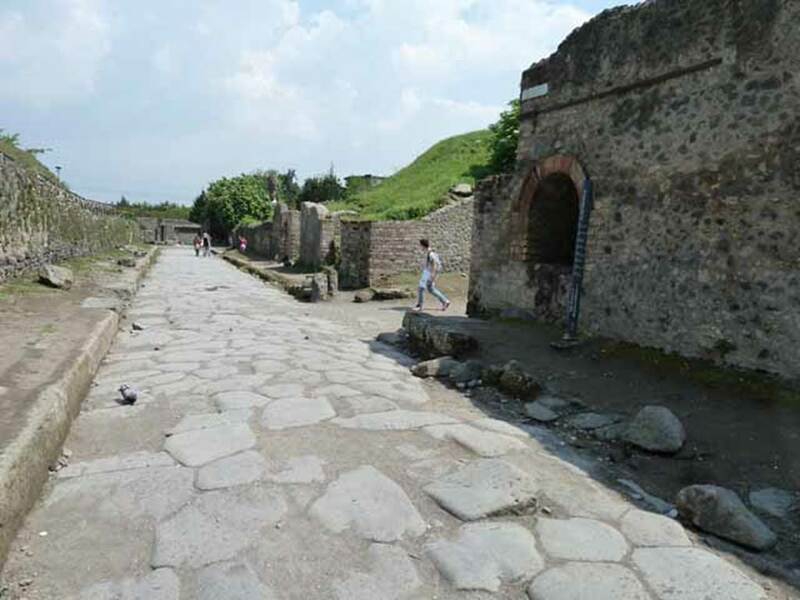 This gateway would have closed the vicolo, which provided the only access by carts, wagons and chariots to the amphitheatre or Palaestra, as a form of traffic-control. Only the pilaster, on the north-east side, which supported this street portal has been restored. Pompeii II.4.7a. June 2012. 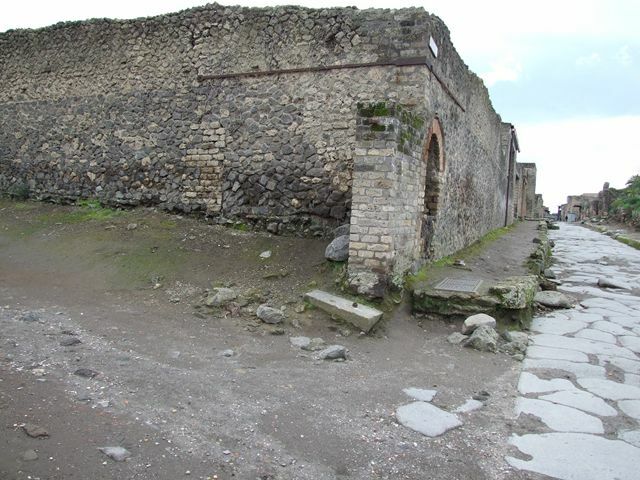 Looking south along Vicolo dell’ Anfiteatro, and street shrine on north-east corner of II.4, on right. Pompeii II.4.7a. December 2004. 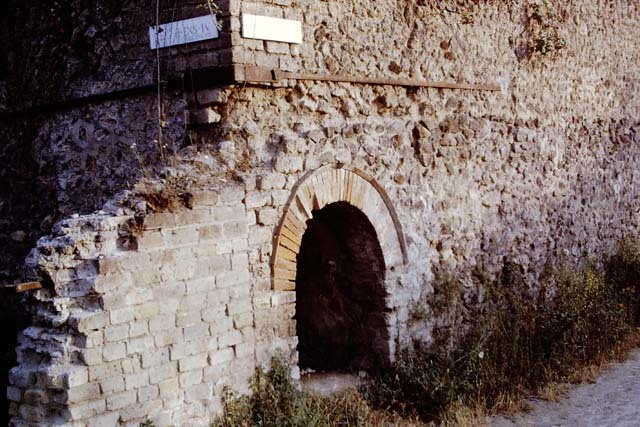 Arched street shrine at east end of II.4, and wall on its west side. II.4.7a Pompeii, 1968. 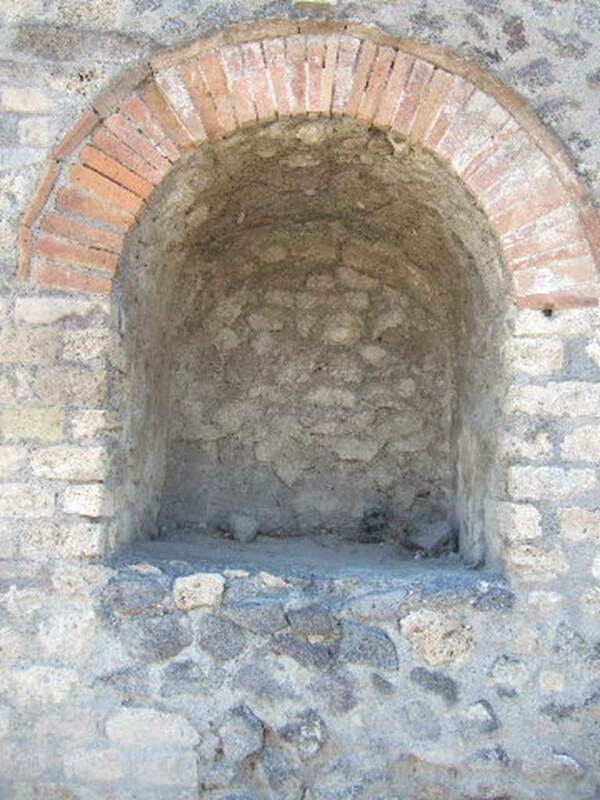 Arched street shrine at east end of II.4. Photo by Stanley A. Jashemski. Pompeii II.4.7a. September 2005. Compital aedicula shrine. When excavated in 1912, two large holes with splinters of wood still attached were found in the floor of the shrine. It was thought these were to anchor the figures of the Lares Compitales. The statues had vanished, perhaps taken by ancient robbers who had cut a hole through the upper left corner of the shrine. This damaged the decorative cornice, bricks and stucco relief on the façade. A number of graffiti were found inside the niche and on the walls outside, scrawled in charcoal by passers-by. These were CIL IV 8503-8516, and published by Della Corte. See Notizie degli Scavi di Antichità, 1912, p.68ff.